Pumpkin recipes are fall food favorites. Cozy and wholesome, they’re always crowd pleasers. 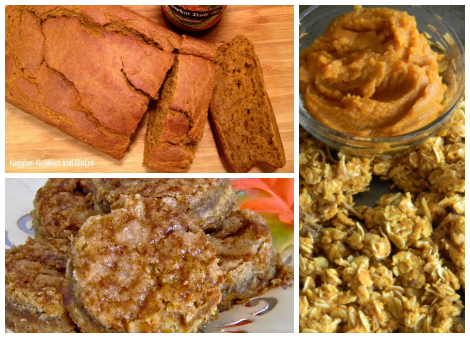 We asked mom food bloggers to share their favorite pumpkin recipes and they didn’t disappoint! 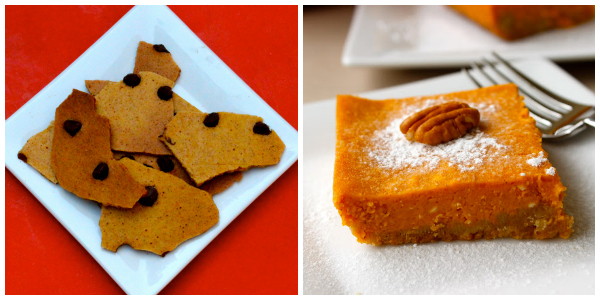 Which one of these scrumptious fall treats will you make first? We have one word for you today: Pumpkin. A fall favorite in 14 delicious forms! Julia Frey is the food blogger behind Vikalinka, a blog where she records her culinary adventures and shares tasty secrets that are at least two generations old. 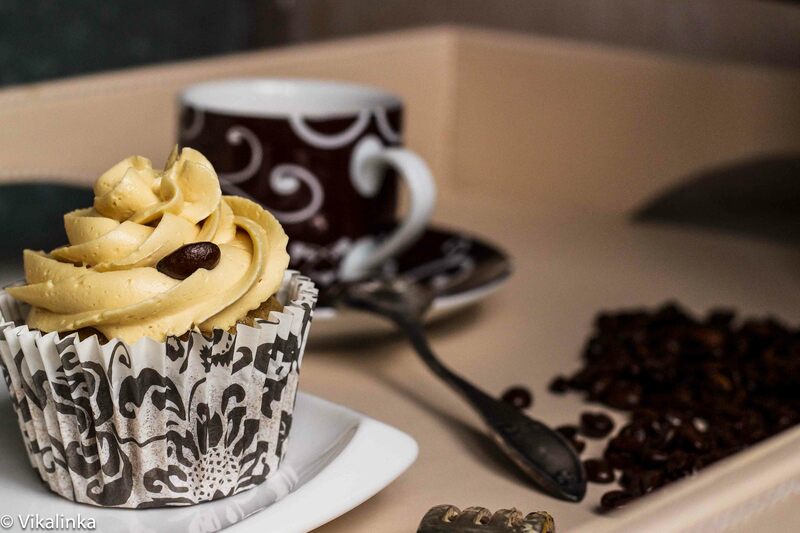 Julia's favorite pumpkin recipe is her Pumpkin Spice Latte Cupcakes. Julia says, "These cupcakes were born out of my never-ending longing for Starbucks Pumpkin Spice Lattes that were not available in England when my family first moved abroad. 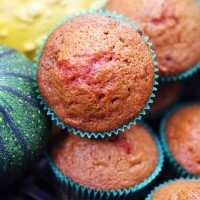 The cupcakes are exactly what they sound like — a beloved autumn drink in a dessert form!" Linda Arceo is the blogger behind Giggles, Gobbles and Gulps, a quirky little blog about all things important — food, drink and a dash of life. Linda has three favorite pumpkin recipes. About her Pumpkin Beer Pumpkin Bread, Linda says, "This is a unique twist on pumpkin bread by adding a little pumpkin beer to the mix." About her Pumpkin Squares, she says, "Pumpkin desserts don't have to be complicated. This recipe is one of the easiest for pumpkin squares!" And about her Pumpkin Granola, Linda says, "Homemade granola is too simple. This recipe blends pumpkin, coconut and pumpkin seeds." Mindy Kobrin is a lifestyle and entertaining expert and chef whose philosophy boils down to one luscious concept: Don't Worry, Eat Happy. Mindy's favorite pumpkin recipe is Banana Pumpkin Loaf. Mindy says, "Banana Pumpkin Loaf is yummy for breakfast, snacks or dessert and is so quick and easy to make! Plus you're getting vitamin C, beta carotene, fiber and potassium in every bite!" Amy Hanten, The Cooking Mom, is a real, busy mom with easy, breezy recipes to get your family back to the table! Amy has two favorite pumpkin recipes. First, is her 4-ingredient Pumpkin Mousse that Amy says is, "so good, so easy and so pretty, too!" And second is her Dinner in a Pumpkin! Amy explains, "You cook the whole casserole right in a pumpkin! It looks so cool when you bring it to the table and it tastes great too!" Kristen Smith is a registered dietitian based in Atlanta, Georgia, with over eight years of experience in nutrition counseling and consulting for weight management. Kristen has two favorite pumpkin recipes. First is her Pumpkin Cookie Bark that Kristen says, "This is a lower-fat, delicious fall treat!" And second is her Gooey Pumpkin Cake that Kristen says, "A lower fat creamy, sweet treat made with pumpkin and Greek yogurt on top of a graham cracker crust." Linda Watson, author of Wildly Affordable Organic and Fifty Weeks of Green, helps you cook scrumptious, seasonal food from scratch at Cook for Good. 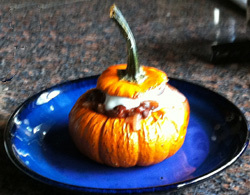 Linda's favorite pumpkin recipe is her Jack-Be-Little Pumpkins Stuffed with Spiced Tomato-Lentil Sauce. Linda says, "Decorate with tiny pumpkins for Halloween, then savor their mushroomy flavor when stuffed and baked." Beth Bader is the author of the cookbook, The Cleaner Plate Club: Over 100 Recipes for Real Food Your Kids Will Love. Beth's favorite pumpkin recipe is really a pumpkin trifecta: Pumpkin Soup served with Pumpkin Toasties and Pumpkin Hummus. Beth says, "You can use the fun of Halloween as a way to get kids to eat healthy treats, too!" Sophie Skover, author of The Continuous Appetite, is a life coach and an inspirational speaker who works to help others experience harmony in their lives. Sophie's favorite pumpkin recipe is a non-dairy pumpkin spice creamer. Sophie says, "Spice up that morning coffee with a delicious and creamy creamer!" Robert Lambert is an acclaimed food artisan whose favorite pumpkin recipe is his Pumpkin Cake with Malted Milk Chocolate Sauce. 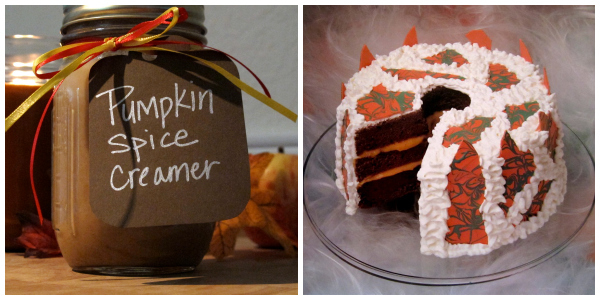 Robert says, "This cake is ideal for any and all fall festivities!"